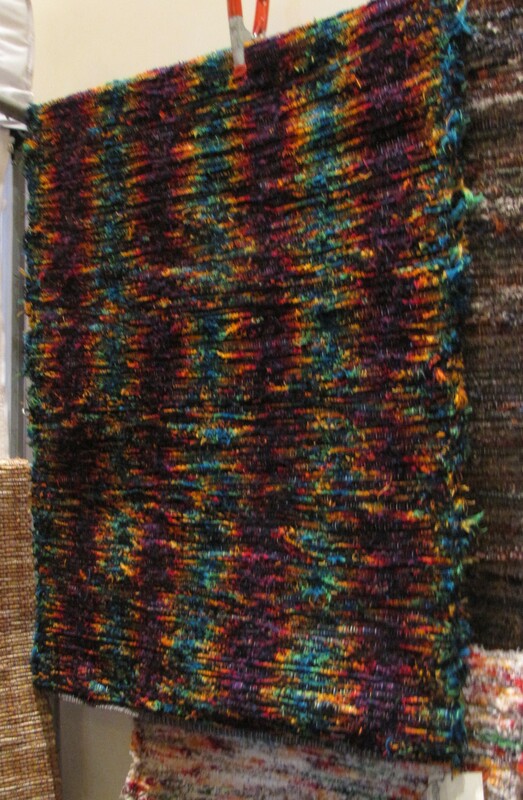 Another picture of wool shag rugs by Cabin Textiles & Woven Hearth. 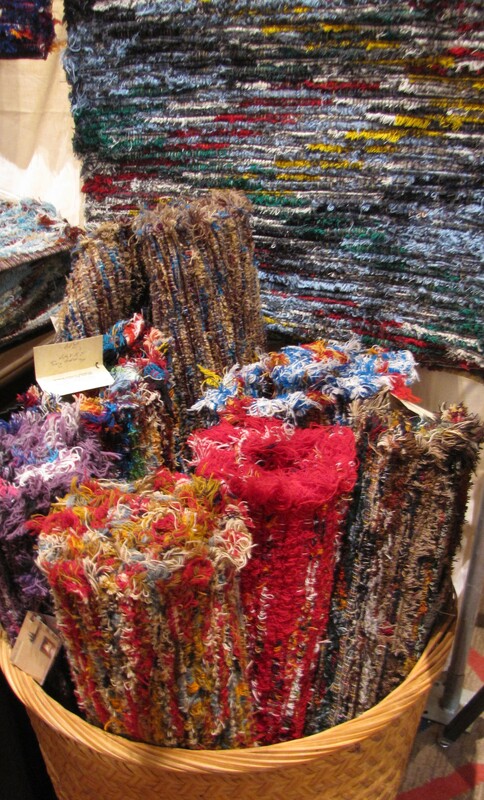 For the 2013 Recycle Santa Fe Show, my mom (Cabin Textiles) and I (Woven Hearth) shared a booth. The booth fee for a single participant is $350 and then a single artist may be added to the booth for an additional $50. As you can see, it’s great to be able to find someone to split the booth fee with. Even though I have only done a handful of shows so far, this was easily the highest booth fee, for a 3-day weekend. However, we both did great at the show, so no complaints from us! 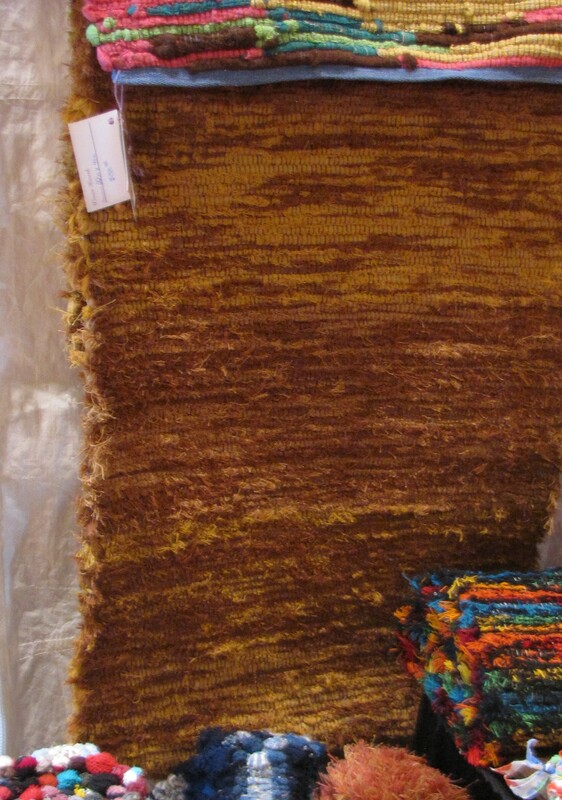 This is a rug made from sweaters (by Woven Hearth). 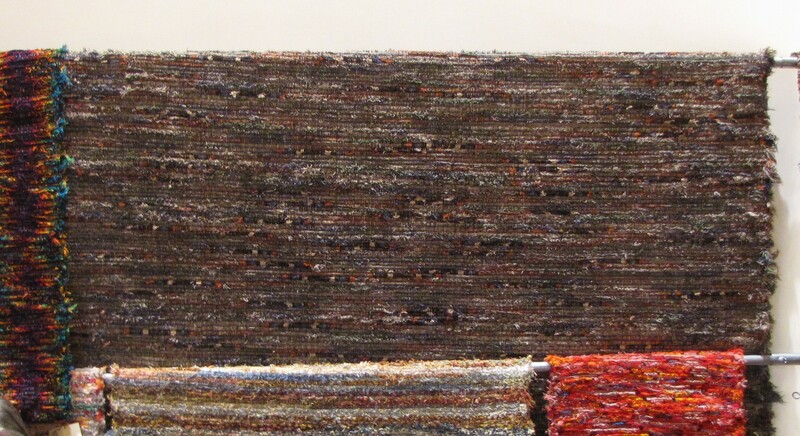 This is a striking wool shag rug from Cabin Textiles. Each show I learn something new. At this one, it was the term, ‘upcycle‘ which is used to describe making high art from recycled materials. Since all the participants in this show were doing recycled art, I could see the full range of items, and the different take on recycling trash materials into art. 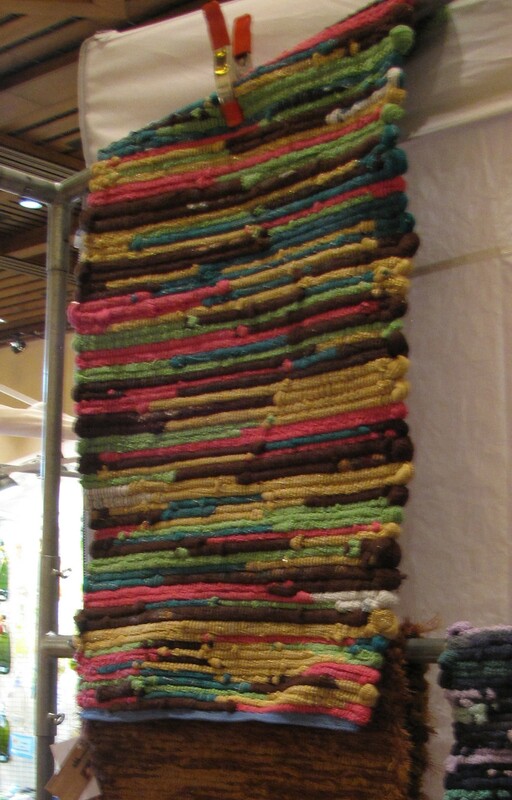 This is a rug made from socks (by woven Hearth). This was also my first time to use my Paypal card swiper gizmo, and it was a success. In fact, all my sales were done with the card swiper. My mom was using her old-school metal & carbon copy swiper for her sales. So we had a direct comparison. I think my mom now wishes to switch to the gizmo, as means less work for her – you don’t have to call in the card charges individually. Hooray for the electronic age! Another wool shag rug by Cabin Textiles. My friends J & J and Bailey dog also gave us a hand in both setting up and taking down. It was very much appreciated! Lugging bags of rugs around is heavy work, and then the metal frame we used for the booth wasn’t a total joy in setting up or taking down. So it was great to have the extra muscle. 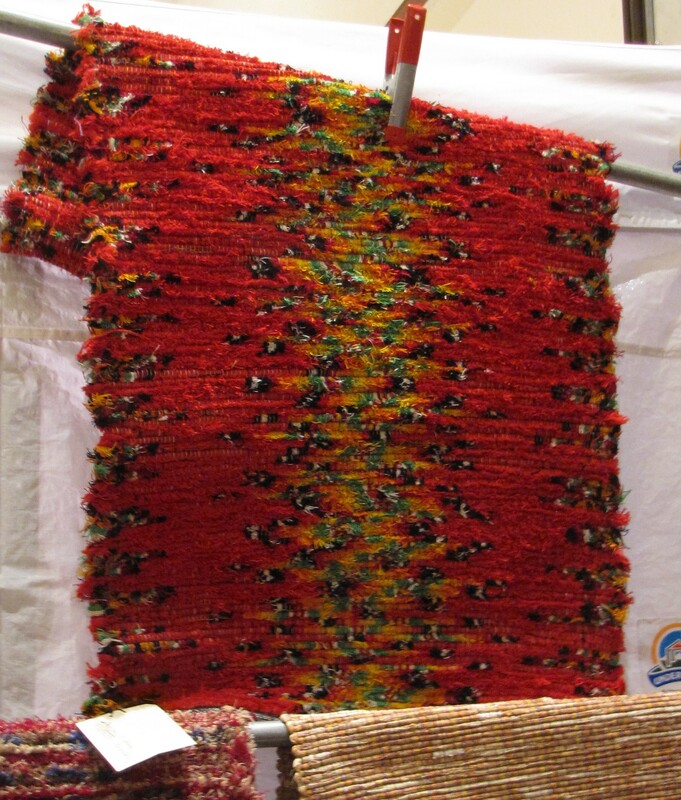 A cotton shag (Woven Hearth) rug. 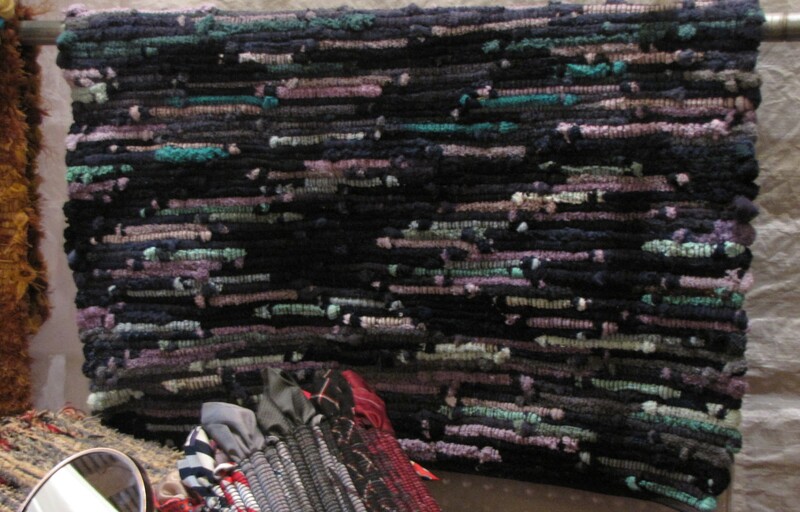 My mom brought a few of her larger rugs, include one off the big loom – 7 feet by 9 feet – and they drew a lot of inquiries. It is rare for one of these larger ones to sell at a show, but letting people know such sizes are available, and handing them our cards, leads to special orders. A variety of our wool shag rugs. This large rug (by Cabin Textiles) measures 9 ft. x 7 ft.